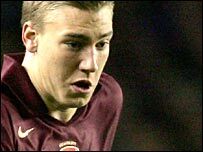 Birmingham have recruited their third Arsenal player on loan, securing the services of striker Nicklas Bendtner. Imposing Dane Bendtner, 18, has signed a deal to stay at St Andrews until January, while Sebastian Larsson, 21, has finalised a season-long loan deal. Swede Larsson has played 12 first-team games for Arsenal and has appeared at both left-back and in midfield. The pair join fellow Gunner Fabrice Muamba, 18, who had sealed a 12-month loan move earlier in the summer. Bendtner scored 18 goals in 24 matches for Arsenal's reserves last season and was on target on the club's pre-season tour in Austria. This summer he became the youngest player to be selected for Denmark's under-21 team and scored two goals on his debut against Spain. "He's been tracked by 12 or 15 clubs so I'm delighted to have got him," said Blues boss Steve Bruce. "I think Arsenal regarded him as their fourth or fifth striker this season but they've obviously decided to send him out for some valuable experience. "Fabrice has trained with us and we believe we have an exceptional footballer for the age of 18. "Fabrice is athletic, 6ft 3in tall and a Patrick Vieira lookalike. He is tremendously competitive and was exceptional when we saw him play for Arsenal against Reading in the FA Cup when he was up against Steve Sidwell and Kevin Harper. "We believe he will do well for us. He wants to progress and play football. We will give him that opportunity. "Sebastian can play anywhere and he played for Arsenal at left-back against us at St. Andrews last season. He is a versatile player who will bolster the squad and I am very pleased we have got him."